This popular nature reserve in northern Chile (many claim it is the most popular) is 459 square miles (740km sq) and is divided into seven sections, all offering highlights of their own. One of the most interesting areas within the Reserva Nacional Los Flamencos is the Valle de la Luna (Valley of the Moon), a surreal landscape of salt peaks formed by uplifted lake sediments that have been shaped into dramatic formations by wind erosion. With a surreal blend of pastel colours the valley is even more enchanting at sunset. Close to San Pedro de Atacama, the valley can be reached by mountain bike or on a guided tour. 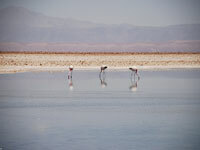 A striking feature of northern Chile's geography is the shimmering and apparently endless salt lakes that are home to many bird species; the Salar de Atacama in the reserve has a lagoon, Laguna Chaxa, which supports three species of flamingos as well as other bird life. The salt lake also affords good views of the volcanoes in the Andean chain of mountains on the nearby altiplano. The stunning desert landscape offers many attractions: hiking, horse riding, bird watching and photography are some of the most popular activities. Be aware that in this desert region temperatures vary dramatically and can drop suddenly.